The reunion was, as always, controlled chaos! A BIG THANK YOU to everyone who came ~ it means a lot to me! 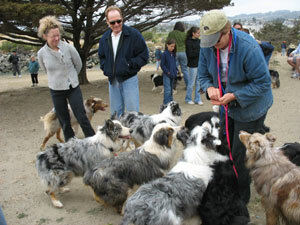 We estimate that 60 Aussies and 100 people attended. 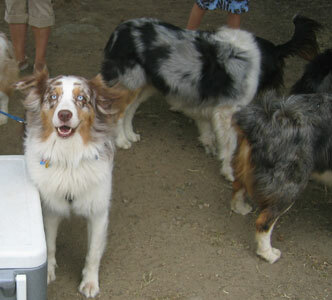 Seeing all "our" dogs again was sheer joy, with episodes of pure exhilaration when 20+ Aussies were in high speed pursuit of Chipper who loves to initiate the game. All of us watched with huge smiles... and knees bent! 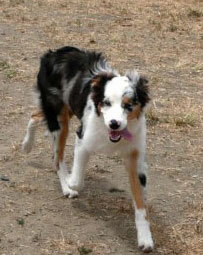 We cooed over the Puppy mill puppies who are gangly and sweet! They all made their parents proud: Gabby and Cinders (Tiffany's litter) and Reddy (Noel's litter) Callie and Finn (Layla's litter) Tank and Keeper (formerly Dewey) who came to us at 5 weeks of age after the first puppy mill raid. 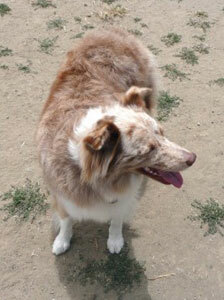 Puppy mill Aussies showed their resiliency: Mama Noel played with the others throughout the reunion. Beautiful Cinnamon, daughter of Tess and Jake (both rescued by NCAR) and Jake who looks just like Cinnamon handled the crowd really well. Bonnie, age 10 who had as many as 15 litters in her lifetime at the puppy mill, is the center of her new mom's life and goes everywhere with her, including the hospital where she works! 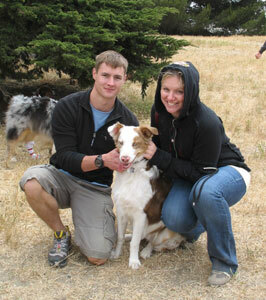 Devoted adopters have given everything to these dogs. Many of the puppy mill dogs as well as really timid shelter dogs have come a long way thanks to the love, patience and training they've received in their new homes. Wild kids were there too ~ and my hat is off to their adopters who have devoted so much time and resources to make their dogs a happy family member. Training, structure, home consultations, running exercise, tons of reading, and a lot of patience is the recipe for these wild kids who had no one to teach them anything in their previous lives. Congratulations to all of you who have weathered many headaches with your Aussies! 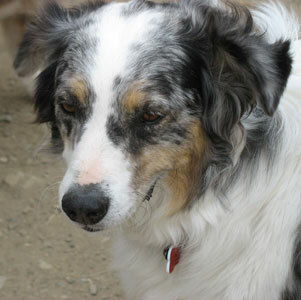 So many looked so much better than they did when they first came to us. 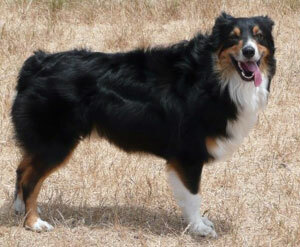 Maggie, a gorgeous black bi who is now a registered therapy dog was 15 lbs overweight and in terrible shape. Now she's svelt and energetic. Granite (now Rocky) a little 15 pound shelter mini, and Demi a 19 pound shelter mini have put on much - needed weight and their coats are long, shiny and gorgeous! 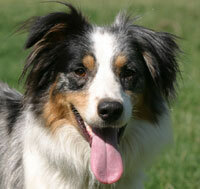 This gorgeous black tri is JACK... one of my first foster Aussies. Isn't he a dream boat? 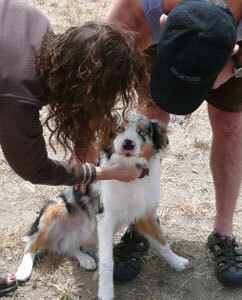 Caron meeting Princess, whom she adopted. 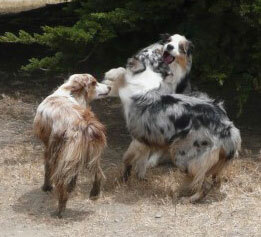 Chipper plays with Boomer and Jamie. 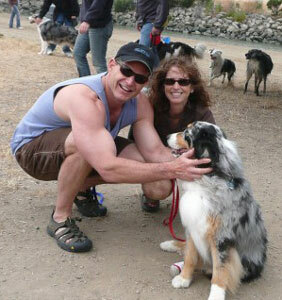 Cinders (adopted 2006) getting lovin' from Linda and Garth. 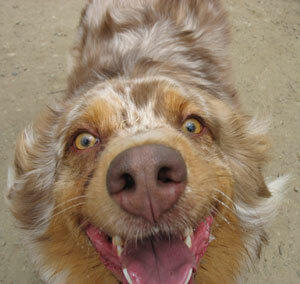 Cinders having a good time! Wahoo! 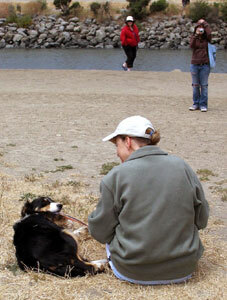 Gabby, (Tiffany's pup adopted 2006) with her Mama. 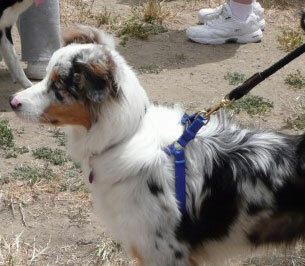 Gabby taking a break from the fun! 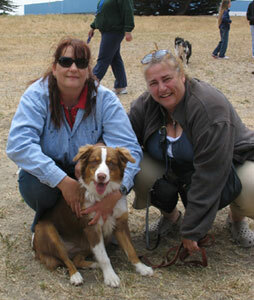 Garth and Linda with their Aussie 'Flash' adopted 2003. 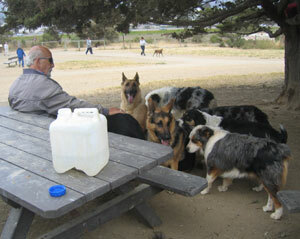 German Shepherds stop by for a visit! Get to know me! 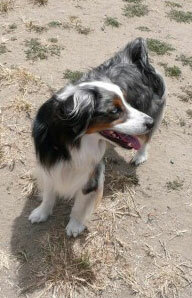 This is Paula's pride and joy, "Tilly"
Jake from the puppy mill, isn't he beautiful? 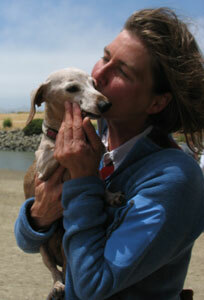 Kendra and her 22 year old Dachsie, who handled the reunion amazingly well! 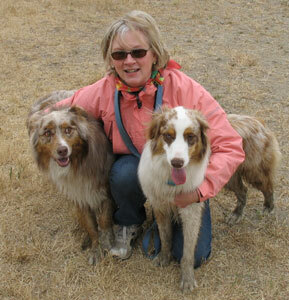 Marcia holding her boys, Guy (adopted 2003) and Chipper (adopted 2006). 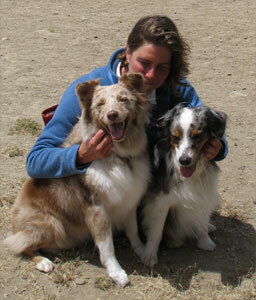 Kendra holding her Aussies, Layla & Merlin, adopted 2006.